US officials have forced the World Health Organization reconsider plans to tackle global obesity rates. A draft document won broad backing at a WHO executive board meeting on Tuesday. But the US delegation insisted further discussion would be needed before a final plan is approved. The US has questioned the science underpinning the plans, which include cuts in salt, fat and sugar intake in diets across the world. The proposals, laid out in a strategy document, are designed to cut disease by promoting healthier lifestyles. 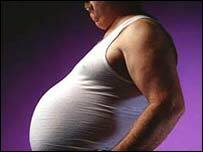 It is estimated that 300m people world-wide are obese, and 750m are overweight. Obesity is a risk factor for heart disease, diabetes and other life-threatening conditions. As well as pushing the food industry to make deeper cuts in sugar and fat in food, the WHO proposals include changes to advertising and tax policy to promote healthier diets. Speaking at Tuesday's meeting, New Zealand delegate Gillian Smith said: "We need a strategy to take us out of the comfort zone, because more of the same is clearly not an option." The food industry has claimed that some suggestions - particularly recommendations on sugar - are not based on hard science. And the US administration has been accused of trying to dilute the proposals to satisfy the industry's demands. US delegation head William Steiger drew criticism earlier this month after writing to WHO director-general Dr Lee Jong-wook to challenge the science on which the proposals are based. Mr Steiger said the report did not place sufficient emphasis on the responsibility of the individual to eat a balanced diet. He also objected to singling out specific types of food, such as those high in fat and sugar. The WHO executive accepted the US proposal that allows governments more time to suggest changes to the document before it is presented to the 192-nation World Health Assembly in May for final approval.